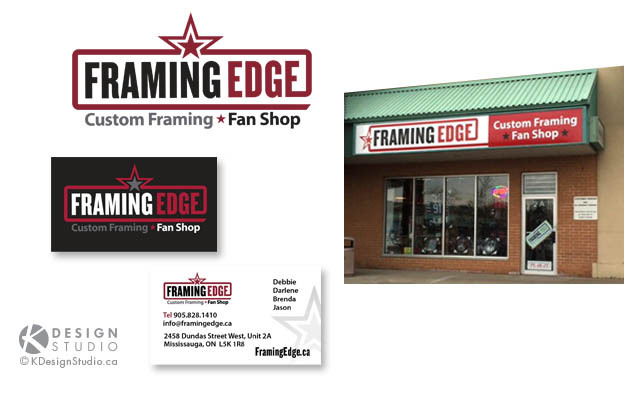 New branding is now completed for Framing Edge; a custom framing and sports fan retail store in Toronto, Ontario. They sell a wide range of sports souvenirs (especially hockey), and are well known for their beautiful custom framing of sports memorabilia and personal treasures. Framing Edge was referred to us by our long-time customer, Stone Age (thank you!). They required a brand refresh that would better suit their professional, sporty feel. We also suggested that they update their tagline to help clarify that they do MORE than just framing. 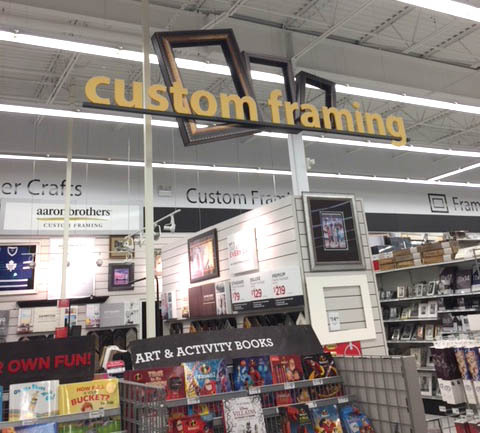 We helped brainstorm on their new tagline which became, “Custom Framing • Fan Shop”. They had not considered changing their corporate colours, but after reviewing concepts, they decided to go with the sporty, fun Canadian look of black and red instead of their previous lime green. The addition of the star element was a nice touch to help give them a mini icon they can play with in their advertising and marketing, and also to help show that their products are sporty, unique and ‘star worthy’ :). Their branding has now been implemented on business cards, store signage and is quickly spreading across all their new marketing material. So relieved that the store signs are up. Our old customers are finding us and new customers are coming in! The sign is very clear from the road, both day and night. You did such an awesome job! We’re super thrilled. Thank you so much.